"Amazing love! how can it be That Thou, my God, shouldst die for me?" Lindell sang this hymn tonight at revival! Our Jesus is an awesome, wonderful Lord. He is God! His sweet mercy, grace and forgiveness is unfathomable. When we choose to follow the Lord, we sign a contract to give our lives away. Let that sink in for a moment. We must die to our dreams, ambitions, selfishness and other ties to the wordly ways. We have become slaves to righteosness or slaves to doing what is right. Do you know what this means? How is this possible? It is only through the Lord and by what He has done that He gives us the ability to do this. "A man's desperation for the things of God should melt away all preoccupations with self, notoriety, public image and social status. 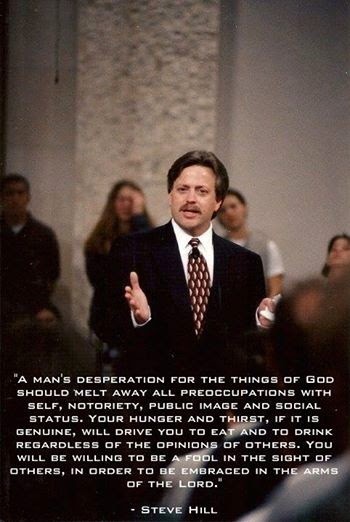 Your hunger and thirst, if it is genuine, will drive you to eat and to drink regardless of the opinions of others. You will be willing to be a fool in the sight of others, in order to be embraced in the arms of the Lord." Jesus loved us so much that he came to this earth and spoke truth to us. He was then beaten, spat on, whipped, had a crown of thorns pressed onto His head all for us. He was then nailed to a cross all for us. At any moment He could have ended it all. Did he do that? NO! He loved us that much. Why did He do this? Why did He have to die? Jesus came and died to turn death backwards. He did what Adam could not do. Now we can have real life, eternal life!